Matthew Greenhough in It’ll Be Alt-Right on the Night at Live Theatre, Newcastle. 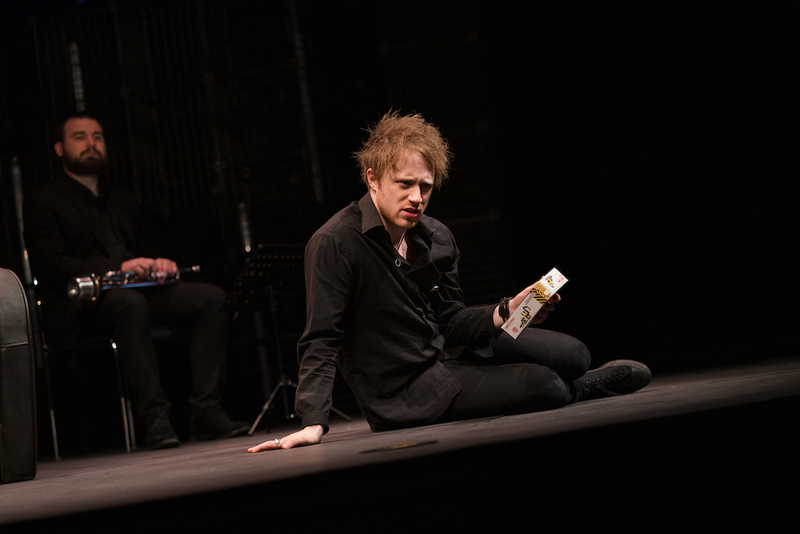 Shown as part of Live Theatre’s Elevator Festival (“new plays by rising talent”), it’s hard to think of a more topical play than Matthew Greenhough’s solo show about Brexit, It’ll Be Alt-Right on the Night. Sheffield boys Steve-o and Greenie have been best friends since childhood, two bullied boys who found identity and escape in punk. In adulthood, though, life pushes them apart, as life tends to do – a rift that becomes increasingly fraught as the toxic politics of Brexit entrenches them at opposite sides of a political divide. Greenhough’s show does a lot of things very well. His writing is not just sharp and funny, it’s actually quite lovely. Superficially it might be all showy swearing and rude, crude jokes, but he uses language fantastically well, skilfully juxtaposing the poetic and the mundane – Alan Bennett with funkier hair. As an unsparing dissection of male friendship, it’s illuminating, peeling beyond brash appearances and the outward rituals of masculinity to the emotional core beneath, and the despair and frustration of working class men whose futures feel beyond them. The piece is very good at capturing what increasingly feels like an unbreachable chasm – with accusations of racism and stupidity on one side, elitism and smugness on the other. There’s a palpable sense of the angry incredulity of the Remain voters (the “I don’t understand how you possibly can believe that?” of it all), while also doing a decent job of explaining the allure of the far right – the appeal of figures like Tommy Robinson to straight white men tired of hearing about their ‘privilege’ when their own lives feel filled with anything but. It could be argued that the plot plays on accepted clichés. Of course, it’s the man who moved to London who votes Remain, his perspective broadened by exposure to the big city, while it’s the Leave-loving hick who stays home who becomes easy fodder for the EDL – an approach that can’t quite shake the whiff of condescension that Remain voters are so often accused of, even when trying to understand their opponents. But Greenhough’s focus on the personal fleshes out the characters nicely beyond mere tropes. A series of vignettes builds a layered picture of the boys’ friendship and eventual alienation, strung together by the records that meant something to them both, from the jazz Steve-o’s dad loved to the punk that they adored as young men. Throughout, musician Steven Wright gives us smooth jazz renditions of punk and new wave classics, a mellow counterpoint to Greenhough’s nervy performance. Such flaws as the piece has are pretty forgivable in a new writing showcase. Jonny Kelly’s direction could be tighter – the flashbacks flesh out the story, but they do occasionally meander, and it becomes a little too easy to lose track of what happened when and to whom. This confusion isn’t helped by the fact that, personable and charismatic as he is, Greenhough’s performance could be more polished – he regularly mixes up his characters’ names throughout, which sometimes makes things hard to follow. But these are teething troubles, easily ironed out, in a show that otherwise feels vital and timely. It’ll Be Alt-Right on the Night runs at Live Theatre, Newcastle until 23 March. More info here.